Playing paintball is like venturing into an alternate universe where you assume the role of a lone soldier leading an army through the wilderness. Opponents choose sides and develop survival tactics in an obstacle course built to resemble the jungle, the badlandz, or the civil war. This is a unique past time designed to excite and the sport is only increasing in popularity. 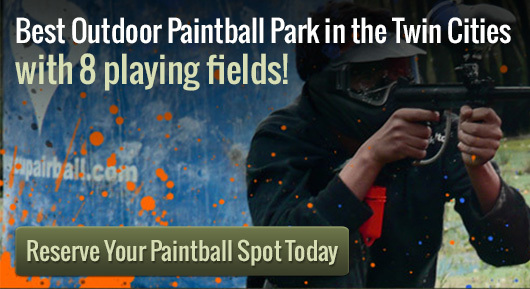 There are eight playing fields to choose from at Action Packed Paintball so the shooting will never get dull. This is a game of strength, strategy and perseverance where people load up and aim pellets full of paint at friends and family. This activity helps strengthen bonds by building a scenario you would not be likely to experience in a real life setting. Playing is great exercise for the mind, the body, even the soul. Reserving a spot at the Action Packed field is as simple as picking up the phone. Staff can be reached at 952-492-6776. This is an excellent way to celebrate birthdays, bachelor parties, even Halloween. Who wouldn’t want to gear up and spend the haunted holiday launching paint bullets in an obstacle course called The City of Tombstone? If you forgot to make reservations, there’s no need to panic. Action Packed Paintball is featuring a walk on play Saturday and Sunday from noon to 5 p.m. All you have to do is show up.